Rolling Hills Hospital provides acute inpatient psychiatric care for adults, geriatrics, intellectually disabled patients as well as addiction treatment. 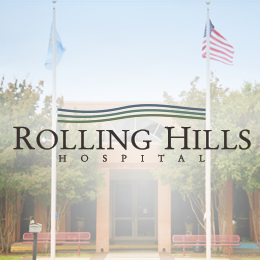 Rolling Hills Hospital is located in the peaceful rural town of Ada, Oklahoma, approximately 85 miles southeast of Oklahoma City. The 108-bed facility is situated on a serene landscaped site, which enables us to provide confidential care in a tranquil environment. Rolling Hills Hospital has been a leader in behavioral health care since 1988. We provide quality inpatient care for those experiencing psychiatric or substance abuse disorder. We maintain a treatment team of professionals dedicated to providing high quality care. An experienced psychiatrist leads our team, which includes psychologists, nurses, licensed therapists, social workers, certified nurse aids, mental health technicians, recreational therapists and other health care professionals within the hospital setting.